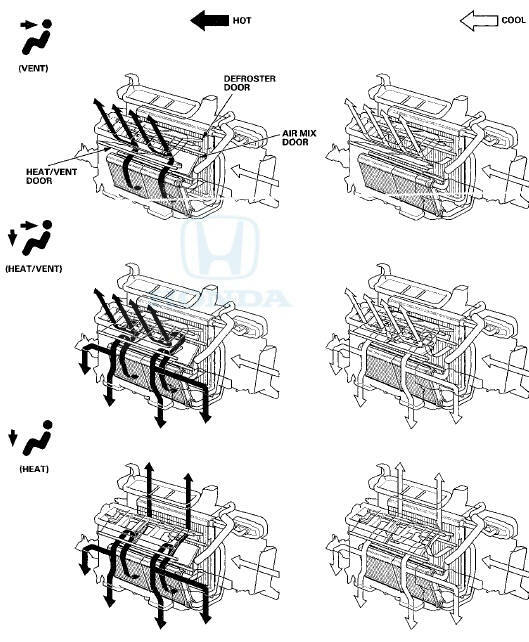 The air conditioning (A/C) system removes heat from the passenger compartment by transferring heat from the ambient air to the evaporator. 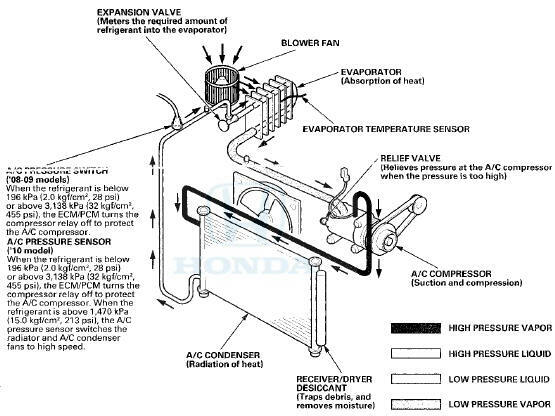 The A/C system refrigerant expands in the evaporator, and the evaporator becomes very cold and absorbs the heat from the ambient air. 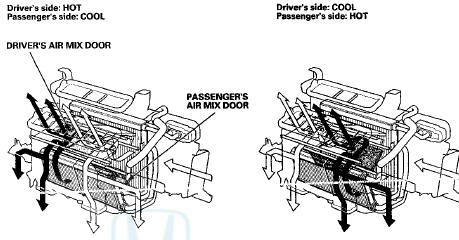 The blower fan pushes air across the evaporator where the heat is absorbed, and then it blows the cool air into the passenger compartment. This vehicle uses HFC-134a (R-134a) refrigerant, which does not contain chlorofluorocarbons. Pay attention to the following service items: вЂў Do not mix refrigerants CFC-12 (R-12) and HFC-134a (R-134a). They are not compatible. вЂў Use only the recommended polyalkyleneglycol (PAG) refrigerant oil (DENSO ND-01L8) designed for the R-134a A/C compressor. Intermixing the recommended (PAG) refrigerant oil with any other refrigerant oil will result in A/C compressor failure. вЂў All A/C system parts (A/C compressor, discharge line, suction line, evaporator, A/C condenser, receiver/dryer, expansion valve, O-rings for joints) are designed for refrigerant R-134a. Do not exchange with R-12 parts. вЂў Use a halogen gas leak detector designed for refrigerant R-134a. 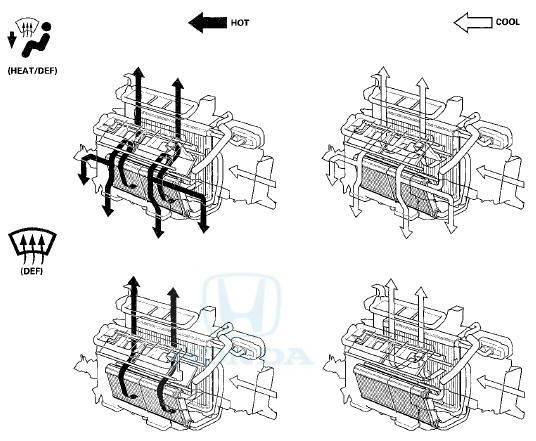 вЂў R-12 and R-134a refrigerant servicing equipment are not interchangeable. Use only a recovery/recycling/charging station that is U.L.-listed and is certified to meet the requirements of SAE J2210 to service the R-134a air conditioning systems. вЂў Always recover refrigerant R-134a with an approved recovery/recycling/charging station before disconnecting any A/C fitting. 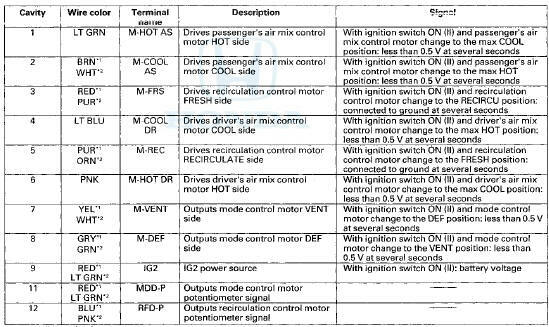 The A/C pressure sensor converts A/C pressure into electrical signals to the ECM/PCM. 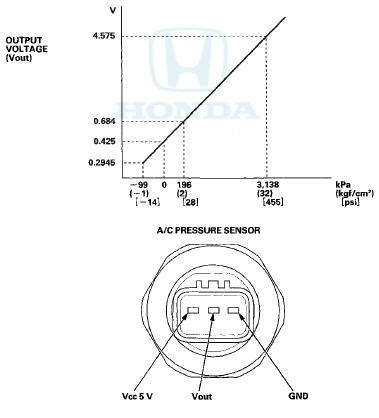 The response of the A/C pressure sensor is shown in the graph. NOTE: When the refrigerant is below 196 kPa (2.0 kgf/cm2, 28 psi) or above 3,138 kPa (32 kgf/cm2,455 psi), the ECM/PCM turns the A/C compressor relay off to protect the A/C compressor. When the refrigerant pressure is above 1,470 kPa (15.0 kgf/cm2, 213 psi), the ECM/PCM switches the radiator and A/C condenser fans to high speed. 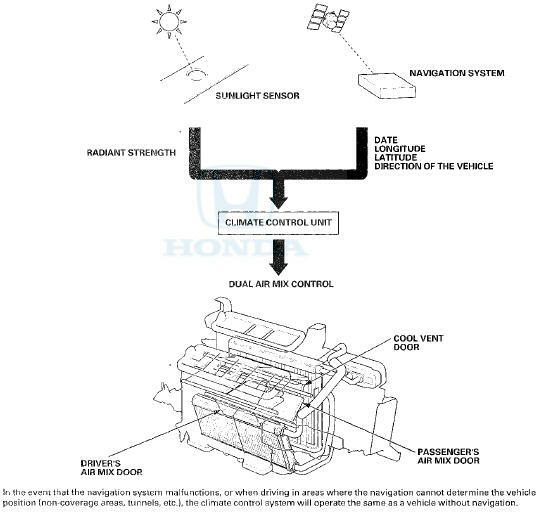 This system automatically controls the temperature and the vent mode of the air direction to the driver and passenger's side depending on the angle of the sun and the direction of the vehicle. 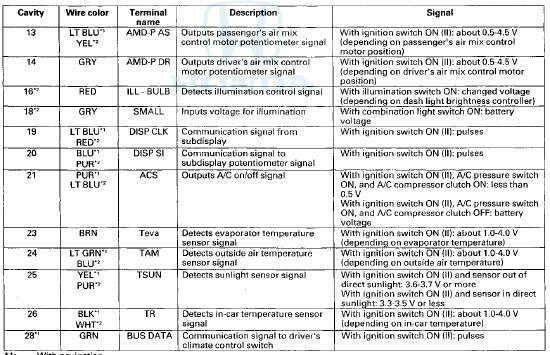 It calculates information such as date, time, longitude, and latitude from the navigation system, as well as the radiant strength of the sun f r om the sunlight sensor, to determine the appropriate mode position and temperature to be directed to each side.